Trade secretary Alejandra Ferrer met today with Pep Mayans and Lydia Álvarez, the chairman and managing director of the association of small and medium-sized businesses in the Pityusics (PIMEF), and Llorenç Córdoba from the local chamber of commerce, in presenting a special Christmas edition of an island-wide drive known as “Compra a Casa”. Ferrer counted 31 local businesses that have joined the campaign since its December 2016 launch, and the 1,717 Formentera shoppers with Compra a Casa loyalty cards, consumers' ticket to big discounts. The programme, Ferrer said, is about supporting independent businesses on the island and enlisting consumers and merchants both in enlivening Formentera streets. Two measures have been introduced as part of the buy-local push. The first, “Al Nadal Compra a Casa” (Buy local this Christmas), rewards shoppers for buying at participating stores with €200, €100 and €50 Compra a Casa gift cards for the first-, second- and third-place winners. With the second measure, “Anar al Mercat de Nadal té premi” (The Christmas Market pays off), shoppers get a ticket for every €15 spent at the Christmas Market, and five lucky ticket holders will be selected to win a €100 Compra a Casa gift card. The drawing will take place on Thursday, January 10, 2018. PIMEF director Lidia Álvarez explained that in 2018, card-holding shoppers spent €1,121,843 at participating Compra a Casa businesses. That added up to €21,689 in discounts. 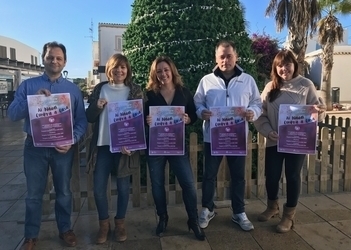 The Formentera Council is teaming up with the chamber of commerce to organise the twelfth Concurs d'Aparadorisme Nadalenc (“Christmas Window Decoration Contest”). Businesses wishing to participate have until November 30 to sign up. Winners will be announced December 4. The first prize includes €225, the second comes with €150 and the third-place winner will receive €75. The three winners will be sent home with a commemorative plaque as well.